Deeply hued and speckled with bits of organic comfrey root for gentle exfoliation, this soap yields a creamy, rich, emollient lather. 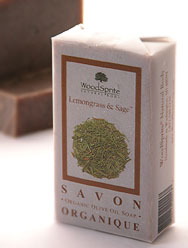 With a special blend of essential oils to heal and tone the skin, also bearing a wonderful earthy-herbal scent. Still one of our best sellers for both men and women since we first began in 1999! Ingredients: Saponified *Organic Extra Virgin Olive, *Organic Coconut, *Organic Palm, *Organic Sweet Almond & *Organic Apricot Kernel Oils; Pure Essential Oils of *Organic Lemongrass, Cedarwood, Sage and Patchouli; *Organic Comfrey Root, *Organic Sage & *Organic Dill. (*Certified Organic) Most skin types. 4 oz. wt.